We have compiled a list of some of the best wallets available. These are bifold wallets, which are a classic choice for men all around the world. Normally, a bifold wallet has a large, sometimes divided, gussets for paper currency. It will sometimes also have a separate compartment for coins. In this case, all of the wallets are made of leather, which varies in quality. There are wallets here for every need, taste, and price-range. Read through this, and determine which wallet is right for you! 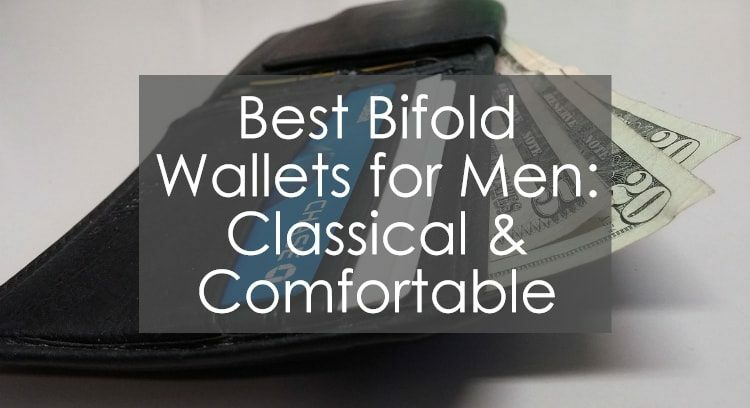 These are the top picks for men’s bifold wallets that we have gathered. These wallets are all high-quality, made of a mixture of leather and textile products. The price range is wide, from affordable (under $45) to expensive (reaching $145). But, make no mistake, they are all high-quality and luxurious products. The basics have been laid out below for your convenience. You’ll be able to see pictures of the product, the product name, our rating, and the price range. Following this, you should have a basic understanding of each wallet, so that you can better understand the full reviews coming later. Classical bifold wallets have been a staple for so long for a reason: They’re convenient to use, helpful, and stylish. While a bit thicker than newer options coming onto the market, a good bifold wallet has far more storage space than others. Bifolds generally have more than enough room for paper bills, credit cards, business cards, IDs, photos, and coins. wikiHow even provides organizing tips. Even more importantly, they can hold all of these without completely destroying or losing them. To combat the extra bulk, many companies have started designing and making more comfortable wallets, for your convenience. Style is a big reason for the bifold wallet’s popularity. The wallets listed below are all made of supple, beautiful leather. They have a gorgeous sheen, and are sure to be admired by those who see you pull it out. When treated with care, the leather that make up these wallets will only become more beautiful with age. One of the main worries about purchasing a bifold wallet is that it won’t be comfortable. They can look awfully bulky, and it can seem like too much to carry. But many of the wallets today have a slimmer, less cumbersome build. This makes them far easier to carry, and far more comfortable to have on your person. But they are very practical options. Most bifolds have a divided pocket for bills; slots for IDs, pictures, and cards; and a place to store your coins. The coin holder is particularly useful, and not always found in non-bifold options. Coins normally fall out of the bill gusset, becoming disorganized and ultimately ending up in your pocket, anyway. Or, worse yet, ending up lost somewhere. Summary: The Bosca Old Leather Continental I.D. Wallet is an expensive, but luxurious, option. It has plenty of storage space available, but no coin compartment. When looking for an excellent wallet, and price is no concern, then you’ll want to consider purchasing the Bosca Old Leather Continental I.D. Wallet. This is, by far, one of the most luxurious classic wallets available, offering the absolute best in the way of style and organizational optimization. The leather that makes up this wallet is fine French. It is hand-stained using vegetable dyes, and the fine sheen comes, not from artificial top coats, but from polishing the leather. This is leather that will stand the test of time, and handle daily use for a long time to come. The design of the wallet is a gorgeous, classical look that will look just as fashionable in fifty years as it does today, and as it would have fifty years ago. This is a truly classical wallet that will last for a long time to come. The Bosca Old Leather Continental I.D. Wallet has valuable storage space, and is an easy optoin for keeping yourself organized. There are two deep pockets for paper bills, to allow for easy separation. There are also eight credit card slots and three additional slots, so that you’ll never be short on space for your cards. Unfortunately, this wallet doesn’t have a coin compartment. This can be a problem, particularly if you tend to use cash more often than cards. Another potential problem is the price. This wallet retails for approximately $115, a rather steep price for some. But this wallet is certainly worth every penny. The luxurious, prime French leather will last long after cheaper wallets have been discarded and replaced. If you are looking for a luxurious, long-lasting wallet, and don’t mind a lack of a coin compartment and a high price tag, then the Bosca Old Leather Continental I.D. Wallet is a great option for you. Summary: The Lacoste Men’s FG Large Billfold Wallet is a very stylish wallet, and is produced by a reliable, trusted company. Though it is a bit large and has no closure, it is handwashable. 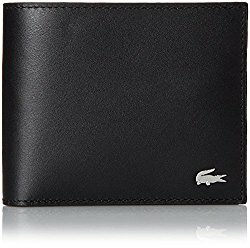 If you prefer a more sleek look to your wallet, then you will want to consier the The Lacoste Men’s FG Large Billfold Wallet. Manufactured by the trusted company Lacoste, it has a smooth, sleek design that is perfect in today’s modern world. It has an affordable price, making it a good choice for those who don’t want to spend too much but who also don’t want to go cheap on a wallet. The Lacoste Men’s FG Large Billfold Wallet is made of a mixture of fine leather and textiles. The outer is made of leather, and features a metallic crocodile, the symbol of the Lacoste company. The inner is made of fabric, allowing for easy cleanup. To further ease cleaning, the wallet is hand-washable. Unfortunately, it doesn’t have a closure. There is plenty of storage available to aid in organization. It has a deep bill gusset, perfect for holding your bills. It also has six card holders, perfect for credit cards, debit cards, business cards, or Ids. A downside is the lack of a coin compartment, which can be a problem for some. Though it has a sleek and stylish look, and it is on the thin side, it might be too large for some to use comfortably. It measure at four inches by five inches. Though it can easily used by some, others might find it a bit harder to carry; switching to a jacket pocket in lieu of a back pocket can make it easier. Summary: This is one of the best options available; it has few, if any, flaws. A rather unique feature is its ability to block RFID readers, protecting your credit and debit cards. 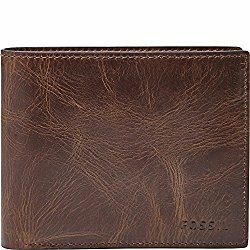 This Fossil Men’s Ryan RFID-Blocking Leather Large Coin Pocket Bifold Wallet is, undoubtedly, one of the best options on this list. It is a very stylish wallet, made of gorgeous vintage leather and styled impeccably. Most uniquely, it has a buillt in layer just beneath the inner fabric covering, so that it can block RFID readers. This is done to prevent “skimmers”, or people who use these readers to steal money from your credit or debit cards. The security this provides is priceless, and this is the only wallet on this list that offers it. Best of all, it offers this for a modest price. The storage space offered in this bifold wallet are great. There are numerous card holders, perfect for credit cards, debit cards, business cards, and ID. There is also a deep gusset for holding paper bills. It has a center flip-out passcase for extra convenience. A coin compartment is situated just inside, as well, so that you won’t have change jangling loosely in your pocket. Even though it has all of this organizational space, it is fairly small and comfortable for a men’s wallet. It is only 4.7 by 3.8 inches, with a depth of 0.8 inches. This means that it should easily fit into your backpocket, and won’t be cumbersome. The price is excellent, as well. While other wallets with fewer features and more flaws might cost more, this remains modest in its price range. The average is only $70. Summary: This is the least expensive option on the list. It has plenty of space, as well as a snap closure, but might not be seen as elegant by all. If you’re looking for a nice wallet with lots of room on a budget, then you’ll want to consider the Visconti TR-35 Classic Tri Fold Wallet. While not as stylish as some more expensive wallets, it is made out of fine leather, and features a snap closure for extra security. It also offers more than enough space for your cards, ID, cash, and coins. But this storage comes at a price: The wallet is on the larger side. It is also the cheapest option on this list. 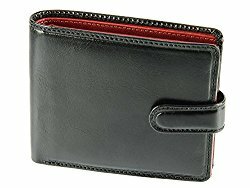 The leather this wallet is made from is comparable to the leather comprising other, more expensive, wallets on this list. It is beautiful and supple, dyed with vegetable-based dye instead of other, less natural options. It is certainly a gorgeous wallet, though the snap closure might take away some of the elegance. The space that this wallet offers is another reason to buy it. While some wallets struggle to hold basic bills and a few cards, this one offers all the room that you could possibly need. It has two deep bill wells, for holding paper notes; eight credit card slots, for debit, credit, or business cards; three ID windows, to display your identification at a moment’s notice; two slip-in pockets; a snap-container for storing your coins; and an extra zippered pocket, to hold the small things you don’t want to lose, such as keys and notes. There is a price to pay for all of this space, however: This wallet is not sleek, and is rather thick. It measures in at 4.55 inches by 3.75 inches, with a depth of 1 inch. This can make it difficult to store in a back pocket. Summary: Perhaps the best wallet option on this list, the Victorinox Men’s Altius 3.0 Innsbruck Leather Deluxe Bi-Fold Organizer is a wonderful choice. It is made of beautiful leather, has all of the storage space you could possibly need, and has a modest price tag. When it comes to choosing wallets, the Victorinox Men’s Altius 3.0 Innsbruck Leather Deluxe Bi-Fold Organizer is probably the best option. It is made of genuine nappa leather, making for a beautiful outer that has a gorgeous sheen. The design is sleek and sophisticated in a very modern way, adding to its beauty. But it isn’t just beauty: This wallet has plenty of space. To make it an even better choice, it is a convenient, easy-to-care-for option. The best, most defining feature of this classic bifold wallet is its sophisticated look. It has a modern build to it, making it look at home with almost any ensemble. The timeless nappa leather certainly adds to the look, giving it an expensive air that the low price doesn’t reflect. And, for such a nice wallet, the price tag isn’t that high: The average is just $70. 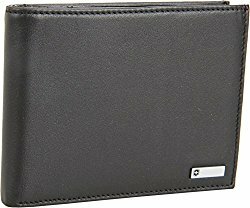 For someone looking for a well-designed wallet for a low price, the Victorinox Men’s Altius 3.0 Innsbruck Leather Deluxe Bi-Fold Organizer is certainly it. But that doesn’t mean that it isn’t practical as well as beautiful. It is everything you could possibly want in a wallet. For storage and organization, it has a leather-trimmed bill divider; six card slots; four storage pockets for miscellaneous items; a pocket with a micro-mesh screen for your ID; a coin compartment with a snap closure; and an interior pocket with a key slot. Even better, all of this storage fits in a relatively small space: The wallet is just five inches by four inches, with a depth of just three-quarters of an inch. This is, absolutely, one of the best choices on this list. Summary: The Fossil Men’s Derrick Large Coin Pocket Bifold is a classic choice in a bifold wallet. It is made by a trusted manufacturer, and has all of the traits important in shopping for a quality wallet, though is a bit bulky. 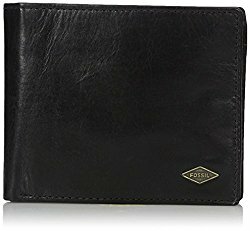 The Fossil Men’s Derrick Large Coin Pocket Bifold is certainly a classic in terms of bifold wallets. It comes from a very trusted and well-known manufacturer, Fossil, which is known for its quality wallets. And this wallet is certainly quality. It is made of beautiful leather with a gorgeous sheen that will last for years to come. It is very durable, and should last you, even with a great deal of use. To add to its convenience, it is hand-washable. This is a very practical wallet. It comes with a great deal of storage space, as much as you could need. This includes eight card slots, for credit cards, debit cards, and business cards; an ID window, for quick access to your identification; two slip pockets for receipts and other miscellaneous items; a single divided bill gusset, for paper notes; and one coin compartment that closes with a flap, for secure coin storage. Unfortunately, all of this storage space makes it rather thick, with dimensions at 4.5 inches by 3.75 inches, and a depth of 1 inch. It might be cumbersome to store in your back pocket. It also has no closure. Summary: A rather stylish option, the Hugo Boss Men’s Boxed Bento Leather Coin Wallet is a great choice for someone who doesn’t mind the high price tag. This beautifully crafted bifold wallet is crafted of the best leather, though isn’t hand-washable. 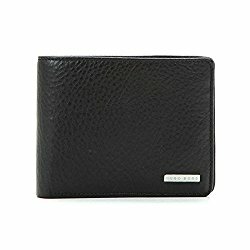 The Hugo Boss Men’s Boxed Bento Leather Coin Wallet is the most expensive option on this list. It is a very beautiful wallet, made out of finely crafted cow leather that is extra-soft. It has the storage that you’ll need in a wallet, though not as much as others. It is embossed on the inside and outside with the Hugo Boss logo. But, beyond that, it doesn’t offer much. It isn’t hand-washable, and doesn’t have a closure. Even with these drawbacks, though, it is still a very nice and stylish wallet. The most visible feature of this wallet is certainly its beautiful, soft leather. It forms a very stylish wallet that looks both modern and timeless at once. This hides the storage available within. It has the standard wallet storage: A place for your card, a deep note pocket, and a coin compartment. You’ll pay quite a bit for this, though: The average price is $145. But, if you want style and don’t mind the price tag, this is the wallet for you! Summary: The Tony Perotti Mens Italian Bull Leather Bifold Wallet is not only a great option for your own wallet, but, because it can be personalized, makes a great gift, as well! This wallet is made of beautiful leather, and features all of the storage space you could want; though it is a bit thick. This is truly a stylish, practical, and cost-conscious wallet. 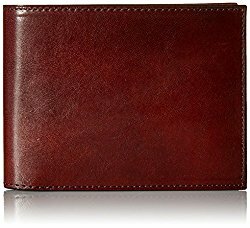 The Tony Perotti Mens Italian Bull Leather Bifold Wallet is a great choice for those who want an excellent, expensive-looking wallet, but without the high price tag. It is made out of high quality, full grain Italian bull leather. It was vegetable tanned, which allows for softer, more supple leather, as well as a far more durable end product. This leather was then made into a beautiful, timeless wallet that will stand the test of time! On a practical note, it has a lot of storage and organization options available: Two receipt pockets, seven card holders, a double bill holder, snap-closure coin container, and a removable ID case. The one downside is that this tends to make the wallet a bit thick and hard to carry. For a little added pizzazz, you can even have this wallet personalized with your initials, or the initials of a lucky recipient. This wallet would make the perfect gift for Christmas, a birthday, or Father’s Day! This list has, hopefully, listed an option for anyone looking for a bifold wallet. These wallets are all high-quality, beautiful products that are sure to fulfill their intended purpose wonderfully. If you still haven’t found what you’re looking for, or the bifold seems to be a bit too large for your taste, please see our review of slim wallets.